The 1st winner will receive a Mixed Bag, valued at $50! The 2nd winner will receive a Melamine Platter, valued at $120! Hello! Please tell us a little about yourself! I hate this question. :) I could tell you my stats (mexican-irish descent, very tall, married, mom) but that's boring. I'm a California girl, turned Hoosier (Indiana) who was born to a Christian, adopted by agnostics, and found Christ again at 22. I found my birth mother at 23 only to find she had died two weeks before I appeared on her doorstep. Ouch, right? I was married a year later to a Midwestern brick mason who comes from a large Catholic family. We have three young girls, two of whom are twins and I work from home while raising them. I have an awesome studio office in my basement that my husband built for me, and it's always a mess because I never have time to straighten anything between meals, laundry, dyeing, staining, designing new product, packing and shipping, etc (so no pictures right now). How did you get started with your lovely shop? Telling this story is a lot like telling my mom when I was little, how I got grass stains on my corduroys. "It was an accident, I swear!" See I was doing my thing with web design for a few years when out of nowhere this seamless background pattern I designed for a website snuck up on me and inspired me to put it on other surfaces. Then, when I wasn't looking, people started asking me if they could buy the stuff I was making. I accidentally stumbled upon Etsy and totally fell in a puddle of customers there and before I knew it I had my own (non-Etsy) shop and stores were calling from all over the country to buy wholesale. I'm still wondering where the last few years went, it's crazy. But my mom would tell me "You must have done SOMETHING to get those stains." So yeah, I've worked hard to design great products that people like to use and I've spent a lot of time getting to know my customers through my blog and through twitter. I read emails from you all the time telling me what you like, and sometimes what you think could be done better (I love those). It feels like it all happens by accident, but my husband will tell you, I work my tail off. In fact, I'm proud of how messy my home is because you know that if I ever have time to clean and tidy, business isn't going so well! #1 - EMULATE, DON'T SIMULATE - Emulate means to try to match or best the successes of another in a way that sets one apart. Simulate means to duplicate one's idea without improving upon it, trying to pass it off as original. Emulate, don't simulate. #2 - OVERPRICE - believe that you're worth what you're charging and other people will too! #3 - TAKE YOURSELF SERIOUSLY - INVEST in everything you need to be a success (logo, branding, website, supplies, software, etc). Don't put yourself out there until you're really ready to be a success and then go for it full steam. Testing the water is safe, sure, but most folks who only stick a toe in tend to burn on the beach. Readers of oh, hello friend will receive 25% off the entire week of the giveaway. Use code "HELLO25" at checkout. Code expires October 25th. 3 prizes will be awarded! with your favorite item from the shop. Twitter or Facebook about this giveaway. Come back & comment with the link! so I can keep track of entries! I love it all, but I wanted to comment about the stained wood tags-- so much fun! I really, really would love to win this!!! :-) Thanks for the chance! First of all... welcome back! We're so glad to have you :) Second of all - oh my goodness - patterned fabric 'ribbon', mini clothespins, amazing package stamps?!!! I simply cannot choose.... love this shop! but i definitely adore the notebooks!! The gift stamps are adorable, and so useful! The Chocolate Twill Tape is perfect for anything! I really love that she sells the Grab Bags too. That's definitely my second fav! i love packaging supplies and olive manna has the cutest stuff. can i have one of everything? i love the brown paper bags. they're not available here in germany so i love them even more!! I absolutely adore those gift stamps! I could see it being expected on my gifts for years and years to come. Too cute! I love the baker's twine. Everything is so adorable. my favorite thing in their shop are the baking twine cones. If I were to win the 50% off, I would have to get everything! Thanks so much. I'm a sucker for clothes pins, so I'm already in love with her store! Thanks for sharing, and please oh please pick me! the link to her blog on your post needs updated! I had to fix it manually in the address bar - just a heads up :) i love the store! im a sucker for twine! loved the hand dyed ones in the shop!! i love the stained wood tags! mini spools of twine & mini clips! so cute! I liked the stained wood tags, and what an amazing story!!! I love the shopping list notepad! How perfectly creative! I just placed my first order at Natalie's lovely shop! I can't wait for the green & brown baker's twine I ordered to arrive at my doorstep; I've got big plans for it in my wedding invitations! I love the lined stamp for labels, gift tags etc.! I'm definitely one of those labelers that must have things straight, so this is perfect and cute! Love the bakers twine and those tiny clothes pins are too cute too! Wow, those notebooks are completely awesome. I follow on Facebook and your blog! She seems so sweet! I cannot get the link to direct to her but I'd still love to win! So many cute and useful things! I would choose either the bakers' twine or the cute wooden tags! eeek...choose just one thing? i love the bunting stamp AND the thank you stamp...so sweet! i love, LOVE the bunting stamp. But there are so many lovely items to choose from! I LOVE the full sheet label paper in Kraft... so simple.. yet I never knew it existed! How could I have not!! Love all the bakers twine and finishing touches! The "Enjoy" stamps are super fun!! oh gosh, how could you choose just one favorite item? I love it all! The first thing to catch my eye, though, were the circle kraft stickers. I love the look of kraft seals! Oh, that Mixed Bag is amazing! I also love the notebooks! I LOVE the gift stamps!! oh no, I love everything !! I'm alreay a follower !! Fantastic giveaway! I tweeted your contest on twitter. in love with everything! twine, buttons and clothes pins - oh my! Picking a favorite is definitely hard to do, I think I would have to go with the Bunting Rubber Stamp, sooo cute!! Great giveaway!! My favorite right now is those tiny clothespins: adorable! I love the baker's twine mini pack! mmmm....loving the notebooks, muslin ribbon and twin tape rolls. I absolutely adore the Stitches Stamp Set and the Burlap Sacks!!! oh and I LOVE the burlap wraps and sacks, wooden tags, and ribbon! Is it wrong to choose the "mixed bag" as my favourite? I can't choose just one! I nearly squealed out loud when I opened the site. I have a special place in my heart for twine and kraft paper! Oh! And I'm a facebook fan. Oh! Please enter me! THanks! I love the tiny clothes pins, i was just looking at them a few days ago! Great giveaway! Oh, geez... there are nearly endless items I love at the shop. Here is one: the thank you flag stamp. and I follow on twitter! i love everything in her shop. but since i had to pick one favorite, i gotta go with the burlap wrap. I love her Stitches Stamp Set... so cute! love her notebooks and mixed bags! stained woord tags...or so cute. I would adore using them of christmas presents this year!! i hope i win the 50% so i could buy them. But i'll be happy winning anything. love the fruits of the spirit print! I like the tag stamps, so cute! i've been meaning to get some tiny clothespins forever! i would definitely get those....and one of everything else! great giveaway and welcome back! I love everything in the shop, so I guess my favorite item is the mixed bag! I love all her merchandise. Quite hard to just choose one. I love the Twill tape rolls in Antique blue! Beautiful! I would love to have the "enjoy" stamps, they would be perfect for tags on handmade gifts! I love that platter. What beautiful things one can create. What a beautiful shop! I love the pennant bunting stamp- so cute! Oohhhh my goodness, this shop is incredible! I am loving the gift stamp that says "this lovely package is especially for." so, so awesome. Wow! Love her shop. My favorite thing is Shadowbox of Vintage Spools. I adore the stamps - especially the ones that say "Thanks" and "Enjoy". The mixed bag is also great! Crossing my fingers! I'm with just about everyone...I love the notebooks. and the burlap sacks. and the kraft dot stickers! I love Olive Manna so, so much. lovely goods. I'll be using the 25% off for sure. i love the fabric ribbon - so many uses! It's so hard to choose, so I guess I'd want a mixed bag! Hm, her website is acting funky for me, but just from looking at the front page--I love that fruits of the spirit print in bright yellow! I'd love to put that in my studio! I tweeted! :) And now I follow you both too! in love with the fruits of the spirit print. very cute. A reaaally nice shop. I really like the mine stained clothespins. My fav fav is the Chicks, Multi - Spring Picnic' fabric!!! Totally diggin the Austen-Beads Plate!! I've always loved that color. Congratulations, btw! i am also a twitter and blog follower! so much to love! the mixed bag is like xmas morning. the Stained Wood Tags would make me smile! and the lovely spirit print - well, that'd look swell in my place. I really loved the Lined stamp, such a clever thing! Simple, and so usefull. My favorite thing from Olive Manna is traveling hot/cold coffee mug! It is yellow with small white pennants on it and it makes me soooo happy every time I use it. I love, love, love the covered notebooks!! Definitely the platters! I've been coveting an Austen blue platter for a while now! Just sent out a tweet about this fun giveaway! Love just about everything in Natalie's shop - especially the twill tape! "Don't put yourself out there until you're really ready to be a success and then go for it full steam"
i love that. took note. The Lovely Package Gift Stamp is ridiculously cute and I'd love to have it! Such a great giveaway! Oh my goodness, everything in her shop is gorgeous! Love the fruit of the spirit print, and the bunting stamp, and the mixed bag is ace! Fingers crossed for me! i love the clothespins and the notebooks. everything looks so perfect. i want all of it!! I love all the cute fabrics!!! What a wonderful collection of goodies. I adore cute packaging materials and the Divine Twine multi pack would come in oh so handy!! i absolutely ADORE her notebooks! they are soo pretty!! I love love love the patterned fabric 'ribbon' and patterned notebook! It's so lovely! I love the bunting rubber stamp and the magnetic clips. i love these. so adorable. So many cute things! I love the "tartan 2" tray and the zigzag with arrows stamp. I also added on facebook (Virginia R). I just saw the lined stamp- also very cute. 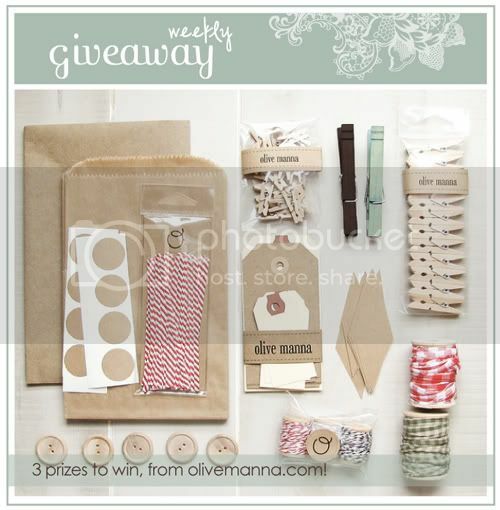 i love all of olive manna's products!! if i had to pick one fave i think i'd say the "enjoy" stamp duo! love. i like the notebooks, very lovely! i love the burlap wrap and the vintage wooden spools! all of olive manna's products are gorgeous! I love everything in her shop, especially the notebooks! Yay! Giveaways are back! So much fun. We missed you! Olive Mamma's products are gorgeous, and I especially love to embelish all my notes and cards with her "stitch" stamps. I just twittered and FBd about the giveaway too! and I'm aleady a follower of both your blog and FB page! Do I really have to pick just one favorite? Everything in her store is wonderful. If I had to choose, I'd say the notebooks are absolutely lovely! I love all of the packaging supplies! I could put those wooden gift tags to some really great use this Christmas season!! I love the Pear tray!! I'm still recovering from reading about Natalie finding her mum only to have lost her... But how wonderful to found Christ again. He has a way of finding us and giving us chances not humanly possible. What do I like? Love the timber tags but my fave is the super cool pennant stickers! What a brilliant idea. I'm also thrilled that Natalie ships worldwide which includes Aussies like me! thanks. I'll be quiet now. oh wow i love the stitches stamp set! love love love it. I love the Stitches Stamp Set. love the fruit of the spirit print! I love the platters and trays, so playful and great patterns! The notebooks are gorgeous! I love them! Pick one? Easy...divine twine mini pack. Who doesn't love pretty string? Really fun shop. I'm torn between the colorful twine and the stamps. I could use these endlessly, great site.